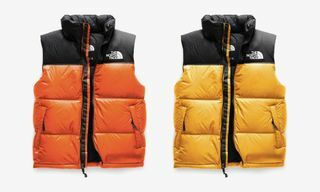 The North Face has achieved what many brands aspire to have but few can ever really acquire: a diverse and wildly different subset of people having an equally diverse and wildly varying viewpoint on what the brand actually stands for. For many, the half dome logo represents pure athleticism and the pinnacle of high-performance technical outerwear, manufactured with scientific precision so man can explore and survive. To others though, it’s just quintessential, reliable Dad-wear—the kind of thing your old man puts on during a drizzly Saturday morning to drive to the supermarket and keep dry. 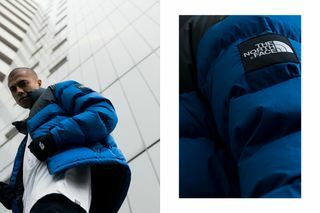 In recent years however, The North Face has become a cornerstone brand for anyone who’s into streetwear, with the label’s iconic puffer—the Nuptse—at the vanguard. With the original 1992 Nuptse re-released in its original cut and block colorways, we deep dive into what the jacket’s made of and what makes it an icon. 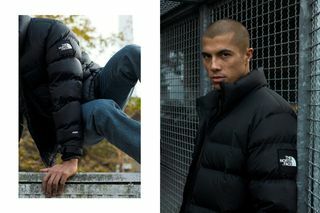 Obviously, The North Face’s perennial collaboration with a certain New York skate brand has helped. 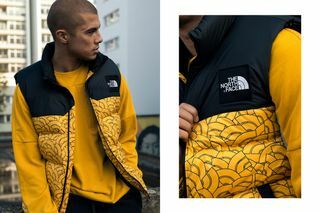 Yet despite some of TNF’s most popular cuts being reworked by Lafayette Street—including the Mountain Pullover, Dot Shot and Mountain Parkas, and the Expedition Coaches jacket—it’s the Nuptse that remains the firm favorite. Like many streetwear icons, the Nuptse’s popularity comes down to its credibility. When you’re faced by the harshness of New York in winter, you’re gonna need a coat that’s up to the task. The original Nuptse jacket—named after the towering mountain that neighbors Everest in Nepal—first came out in 1992 at a time when TNF was expanding and innovating with input from athletes, mountaineers and even the US Marine Corps. 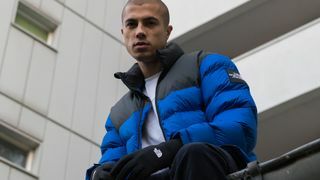 As streetwear expert Ross Wilson comments on these pages, “the Nuptse’s simple styling and 700-fill goose down insulation ensured it quickly became a NY staple” alongside heavy duty boots and denim. These credentials unsurprisingly carried it into the world of hip hop, so by the time the ’00s came around, the puffer jacket—and the Nuptse in particular—was ubiquitously a part of the credible street looks and the hip hop uniform. Wear it yourself, and you immediately feel like a boss—it gives you stature and bulk. 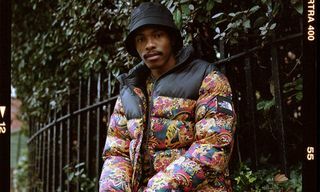 Additionally, now that designers who grew up in the ’90s are coming of age and heading up labels and brands themselves, the puffer jacket as garment is back on people’s radars via the runway. 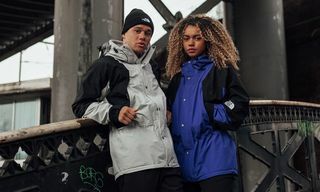 Yet while puffers are the subject of fashion trends now, the Nuptse itself has, and always will have, pure staying power; it represents the best in functional streetwear—an essential, reliable, well-made piece of kit. It may be on trend, but it never really went away in the first place. 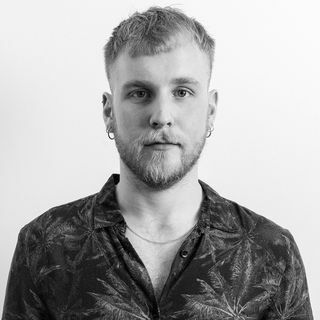 A lot of contemporary fashion brands claim their products are functional when in reality, outside of aesthetics, they’re about as useful as a chocolate teapot. 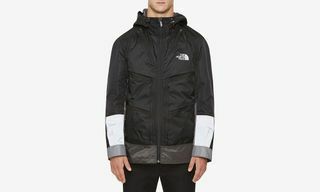 The North Face is revered among real outdoor enthusiasts because everything it designs is subject to extreme professional scrutiny. All of TNF’s products are fit for mountainous expeditions and serious outdoor adventures should you want to expose them to that thanks to an intense four-step process to develop new ideas and products. The Nuptse is no different. The steps one and two involve early-stage research and development with the world’s leading outdoor athletes and innovative material engineers. The North Face Athlete Team is constantly out in the field experiencing some of the harshest conditions known to man and these individuals provide the brand with regular feedback on the clothing and equipment that’s essential to their survival. These learnings provide the material engineers with the knowledge they need to push the boundaries of clothing and equipment design. Steps three and four are about designing, constructing and then testing products. Once The North Face’s all-star team has developed the right fabrics and components, they can be implemented in the latest gear. What follows is a series of extreme field tests and what the brand describes as “a tortuous battery of laboratory tests.” It’s not simply a question of, “do they perform?” but rather a deeper analysis of exactly how they perform. After receiving feedback, the team can make adjustments until the product reaches the brand’s exacting standards. 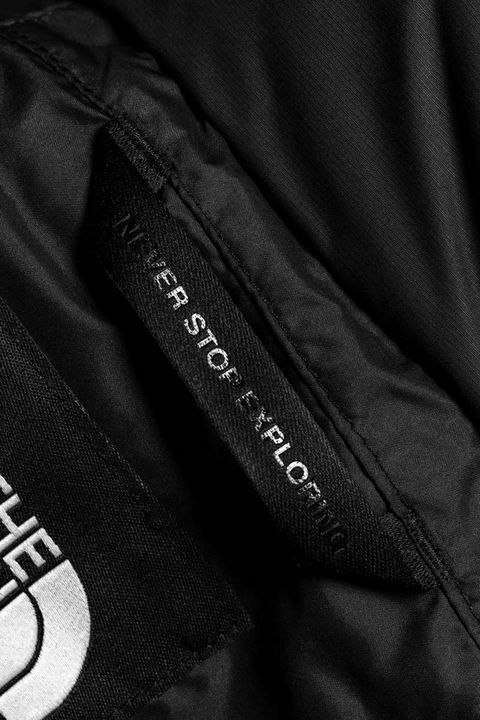 The Nuptse’s most cherished feature is arguably its cozy down that protects the wearer from the cold. 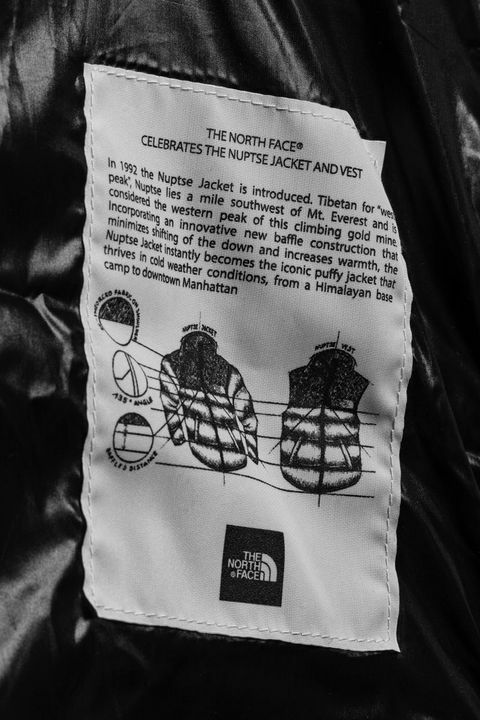 The 1992 Nuptse employs a 700-fill down that is packed snugly into baffles (the individual puffy sections that stop the insulation falling to the bottom of the jacket and exposing the shoulders). 700-fill is the garments “fill power,” a measurement of the downs ability to trap air and insulation, and the Nuptse sits on the higher end of this scale. 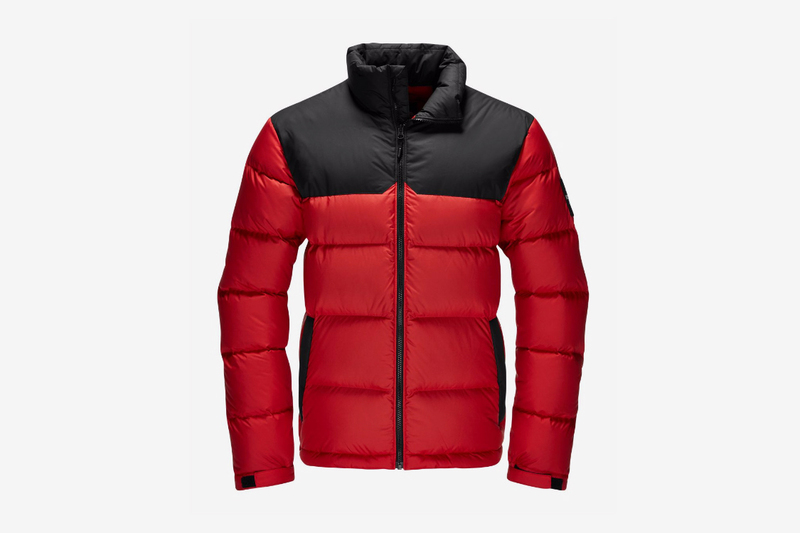 The North Face hits a sweet spot that’s warm but breathable. It’s also developed the Responsible Down Standard to ensure no unnecessary harm comes to the animals in the goose down and feather supply chain (read more about the standard here). This is also known as the subtle flex and is a hallmark of the age we’re living in now compared to the previous time puffers were in vogue—that being the ’90s. From notable appearances on the backs of Missy Elliott’s Under Construction through to Bodega Bamz and Notorious B.I.G., puffer jackets were styled and worn in ways that exaggerated other elements of the jacket as if it needed to match the bulk of the quilted puffer itself. 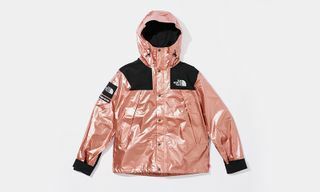 Today, things can be a little more low-key, with the signature bulk and size of the jackets being the main talking point rather than the extravagant materials and the colors used. Palettes are best left primary, while material choice can flex but should be muted. Witness TNF’s latest Nuptse collab with Supreme—a simple, subtle, strong trade-up into full leather. In terms of drawing the silhouette though, it’s easiest simply to juxtapose the bulkier top against straight, slightly slimmer bottoms for something contemporary, or a baggy bottoms—ideally denim—for the original ’90s look. 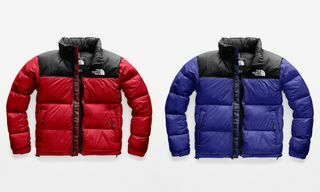 Check out our exclusive shots, above, for style pointers with the original 1992 Nuptse, reissued this year to mark 25 years of the jacket in its original block colorways or TNF’s celebratory film, below. 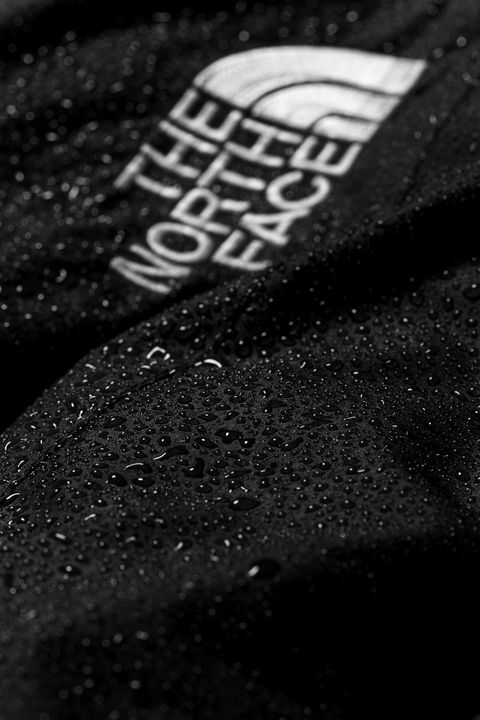 For more on The North Face, check out the west coast brand’s incredible International pack.